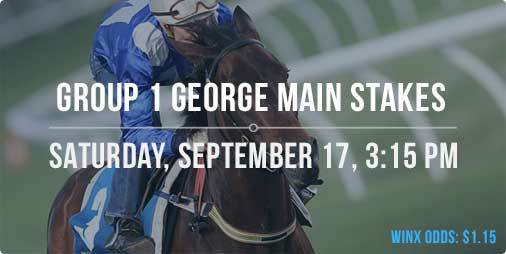 IT’S always an exciting day when champion mare Winx is racing and the Group 1 George Main Stakes is the next target. Winx is going for 11-straight wins in the $500,000 feature at Randwick, but that’s not where the action stops. Punters will be betting into the likes of the Tea Rose Stakes and the Schweppes Heritage Stakes where Russian Revolution is looking to remain unbeaten from four starts. English has been a horse which punters have been waiting for to resume and it kicks off its spring campaign in the Group 2 The Shorts. The Waterhouse/Bott-trained mare could be the boom horse of the spring and one that punters make a sizable profit off. The racing at Randwick starts with the Highway Handicap where the outer-city thoroughbreds make a name for themselves in town and Sportsbet.com.au will give you $50 back in bonus bets if your horse runs second or third in the first five races at Randwick. Hanwritten took on some tough company in Brisbane last start and its form prior was good enough to win at this level. The Matthew Dunn-trained gelding kicked off its career in 2013 with a win over the classy Ball Of Muscle before spending almost three years on the sidelines. The last time it ran second up was a 3.3-length win at Ipswich and the $3 looks a good price. Leami Astray is a talented last start winner which hasn’t finished out of the money in five career starts. The Robert Price-trained mare won by 2.3 lengths last start and although this is a harder target, it doesn’t win by small margins. Its two other wins came by margins of 5.3 and four lengths, so respect here on the second line of betting at $4.60. Moss My Name is bred to handle wet track conditions, but will likely run well on a dry surface. The daughter of Mossman finished only 1.2 lengths behind Quatronic last start in a Highway Handicap and it was able to win at the same level in late August. Chance here with Brenton Avdulla in the saddle at odds of $7.50. Signposted has been a revelation this year with four consecutive victories and it’s entitled to be respected up in grade. The John Thompson-trained gelding kicked off its winning streak with a 5.8-length win at Hawkesbury and made it four straight at Randwick last start. It has the ability to run over longer distances, but it sets the pace and could be tough to run down at $8.50. Magicus comes over from Melbourne having finished fourth at Sandown in this grade. The Chris Waller-trained gelding was running on well behind Refulgent and despite having never run right-handed, it should be well educated and Hugh Bowman is a key addition in the saddle. Drawn wide, but $6.50 is a solid each way price. Fabrizio is a well-bred type which wasn’t far away last Saturday at Rosehill. The Waterhouse/Bott-trained gelding is better suited chasing the pace and it should be suited by the big field. It has been well supported into $6.50 and it looms as a major player in this. Russian Revolution is looking to remain unbeaten from four starts after winning the Vain Stakes last start. The Peter and Paul Snowden-trained colt was sent to Caulfield last start and it did the job well by beating Highland Beat. The son of Snitzel has since run second in a trial to prepare for this and $4 is a reasonable price in a tough field. Tango Rain is a quality colt for Gerald Ryan which has drawn wide in barrier 11, but has the tactical speed to overcome that. The Manhattan Rain colt finished second behind Star Turn in the San Domenico Stakes last start which is cracking form for this and its form prior was excellent. It has shown the ability to win on rain-affected tracks so conditions won’t be an issue. Equal favourite at $4. Guard Of Honour was an impressive winner at Warwick Farm last start when beating Fanning by 1.3 lengths. The Kris Lees-trained colt won a trial earlier this month and drawing the inside barrier is ideal for this. Hugh Bowman rides and the improved track conditions will help. $6.50 chance with bookmakers. Foxplay was a strong winner at Randwick last start and it has been in excellent form since resuming from a spell in June. The Chris Waller-trained filly won by three lengths at Rosehill in a two-year-old handicap and its only defeat in the last three starts came behind the well-performed Awoke. Bowman rides and it should land in a good position from barrier four. It opened at $2.90 and has been bet into $2.70. Global Glamour finished third behind Foxplay last start, but it should have finished closer. The Waterhouse/Bott-trained filly didn’t handle the Randwick turn, but still managed to run on well. It should be better educated for this and given the amount of money placed on it last start, expect the current price of $4.60 to drop. Awoke looked good winning its first two starts, but was a major disappointment when running 11th behind Foxplay last start as the $5 favourite. Trained by Chris Waller, the three-year-old won over this distance second up and the drop back to the 1200m last start might have been too sharp for it. Consider in this at $8.50 which is a good price. Preferment ran on well behind Hartnell last start and it has won twice second up. The Waller-trained horse is classy at best as shown when it won The BMW last season and it’s a type which can find its best form quickly. It has won three times at this distance and $9 is the best price punters will get for Preferment this season. Hartnell produced one of the best runs this year with its 7.8-length win in the Chelmsford Stakes at Randwick. The John O’Shea-trained gelding has been in great form this campaign which included a second placing behind Winx in the Warwick Stakes and another good showing is on the cards. $1.50 is short, but it will be running through many horse racing multi bets this weekend. Storm The Stars has the ability to win at this level as it showed in Europe, but it will need to improve its form to topple the favourite. The Waller-trained import finished third behind Hartnell last start and would have taken plenty out of that run, but it will need to find a few lengths to turn the tables. Look for it to feature over the longer staying distances. Champion mare Winx has this race at its mercy and it shouldn’t get beaten at odds of $1.15. The Chris Waller-trained mare is shooting for 11 consecutive wins and until it faces a field of any note, it’s not going to get beaten. Put clearly on top here. Hauraki was an impressive winner in the Tramway Stakes last start over race-rival Le Romain and it’s paying good odds to win the race with Winx excluded from the market. Hauraki is currently the $2.90 favourite to effectively finish second behind Winx which is much better than the $1.26 being offered for a top three finish. Consider for that option. Tosen Stardom was luckless last start in the Dato Tan Chin Nam, but it won’t find life any easier here. The former Japanese runner is vying to give trainer Darren Weir his first Sydney winner, but he might have to wait a little longer. Tosen Stardom is currently $3 in the betting without Winx market which is its best chance. Japonisme is a group one-winning gelding which is expected to perform better than it did last start when sixth in the Concorde. The four-year-old is a six-time winner from only 16 starts and three wins have come at this distance. The Arrowfield winner is paying a good price at $8 and that’s value. English could be one of the boom mares this spring and it looked outstanding in two trial wins to prepare. The Waterhouse/Bott-trained mare is unbeaten in two fresh up starts and enters this campaign having won the Group 1 All Aged Stakes over Black Heart Bart in April. That form has been franked on multiple occasions and there’s no hiding the fact that Waterhouse believes English is her spring ticket. $2.60 on offer and we expect that price to shorten. Kaepernick is an enigmatic runner which should always be respected fresh up. The Hawkes-trained gelding has won twice from five fresh up starts and its trial effort this campaign have been solid. It won at Scone two starts back by 2.3 lengths in a quick time and if it can repeat that effort, it will go close in a harder field. Its opening price of $9 has dropped a half-point to $8.50. Chris Waller lines up Tsaritsa which looked the real deal during the winter, but it has been a touch disappointing since. The four-year-old finished only third last start at Randwick and it should improve with the run under its belt. Dropping in weight down to 54kg with Tommy Berry in the saddle is a blessing and it won’t get a better chance at the weights to return to winning form. Equal favourite at $5. Happy Clapper is the class horse of the field having run second in the Group 1 Doncaster Handicap before running third in the Group 1 Queen Elizabeth. The Patrick Webster-trained gelding resumed with a solid fifth in the Tramway Stakes last start and it saves its best for Randwick where it has won on three occasions. Carrying 59kg against some talented horses will be tough, but given its form, the $5 is a great price. Federal is a professional gelding which rarely goes a bad race. The John O’Shea-trained gelding is a four-time winner from 14 starts and it should be in fit order having finished second behind Felines in the Concorde last start. It doesn’t have the form of both Tsaritsa and Happy Clapper, but it gets in with 54.5kg and Craig Williams rides from the inside barrier. Not without a chance and bookmakers are keeping it safe at $5. Torpenhow only battled behind Fabrizio last start, but its form prior was worth mentioning. The Godolphin gelding won by 5.8 lengths on debut before following that up with a four length win at Wyong. It looks to have plenty of ability and dropping from 61kg to 58kg will help. It opened at $6 and is currently $5 so respect its chances. The form of Daysee Doom can’t be faulted as it’s unbeaten in three starts. The Ron Quinton-trained mare scored its first two wins with ease over average fields, but it narrowly defeated a tough Pioneering last start and its trial form has been good leading into this. There’s still plenty of unknown about the mare, but it should run well at $4. Denpurr faced some tough opposition last campaign which included Southern Legend, Tempt Me Not and Spill The Beans. Its form is average, but it has had two trials to prepare and it placed in the most recent, so consider here at double-figure odds of $16.